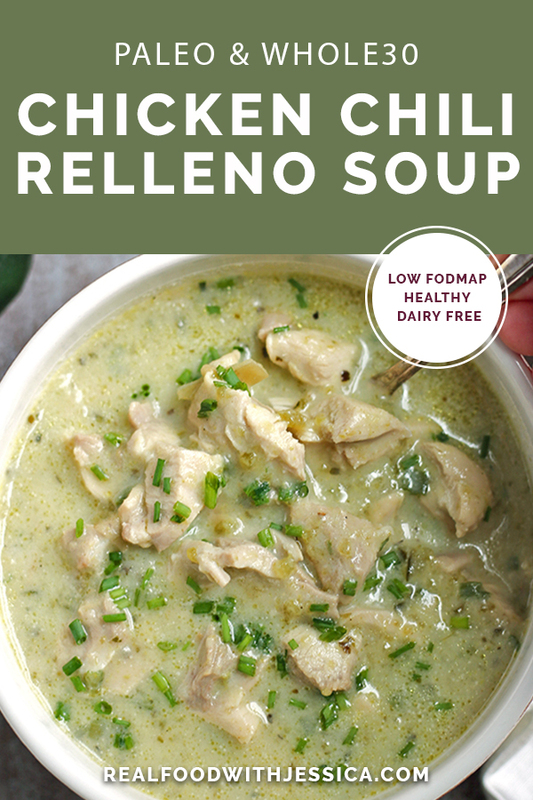 This Paleo Whole30 Chicken Chili Relleno Soup is creamy, flavorful, and so delicious! 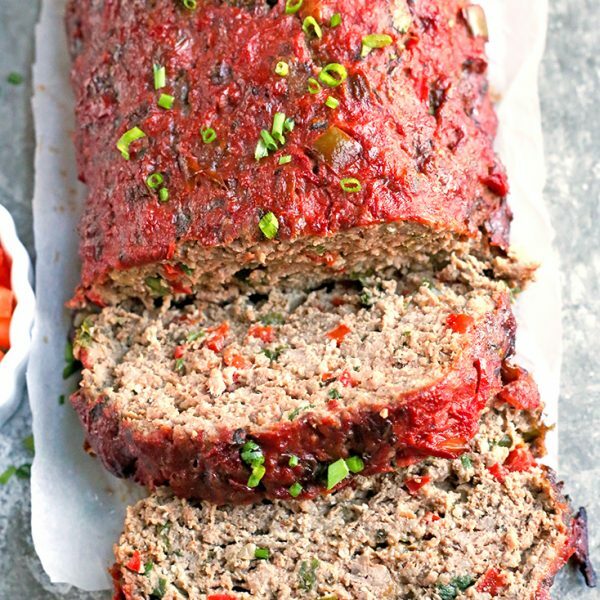 A healthy gluten free, dairy free, and low FODMAP meal the whole family will love. I saw this soup on a keto site and it called for a lot of cheese and more cheese. It sounded delicious, but I knew something needed to replace the cheese that would still make it feel comforting and creamy. I decided on my secret to my Paleo Pot Pie Soup- creamy mashed potatoes. It works so well and gives it thickness and creaminess. 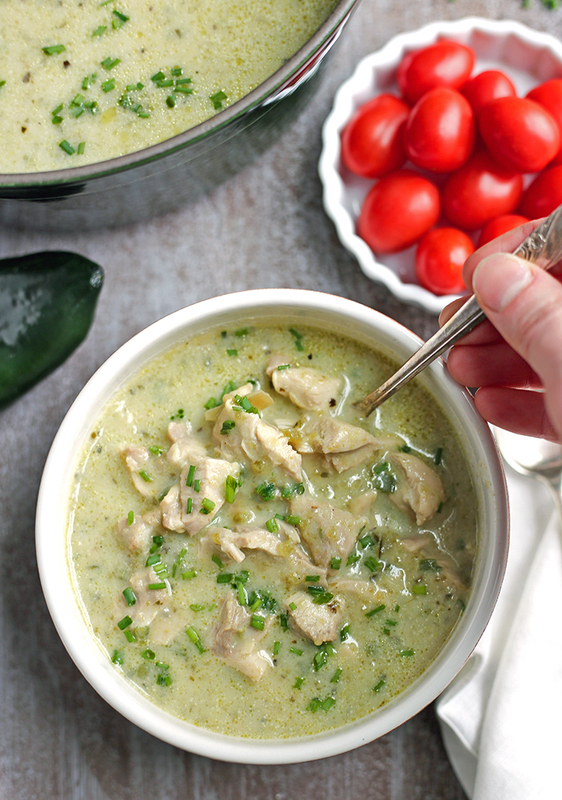 Poblano peppers (sometimes sold as pasilla) are the main ingredient of this soup and they aren’t spicy at all in case you haven’t had them. They have a nice mild smokey flavor. They get roasted and peeled before getting blended up. For the roasting, I just put them in my air fryer until charred, you can also use your oven on broil. Then place them in a bowl and cover it so they steam and the peel comes off easily. 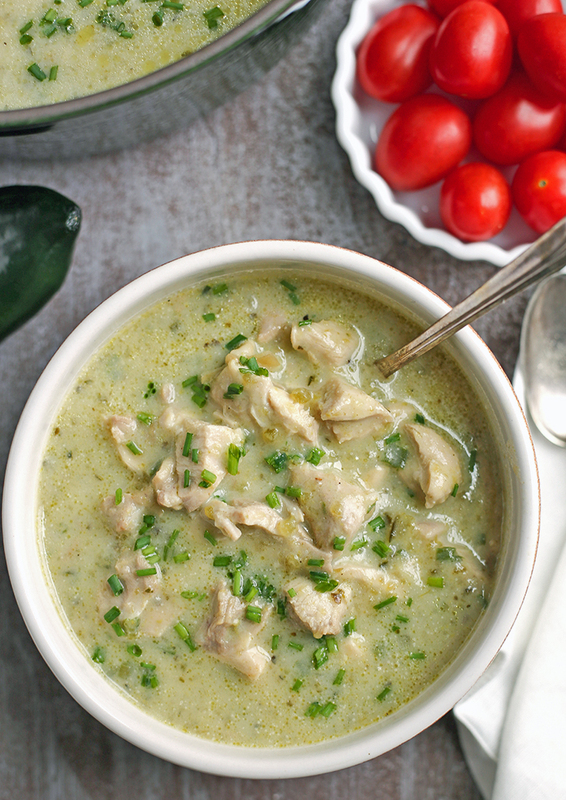 The chicken is added to the soup raw and cooked, then removed and chopped. I don’t love cutting raw chicken so this is a nice way around it. You could easily chop it first if you prefer. I used chicken thighs, but breasts will also work. It’s a flexible recipe. 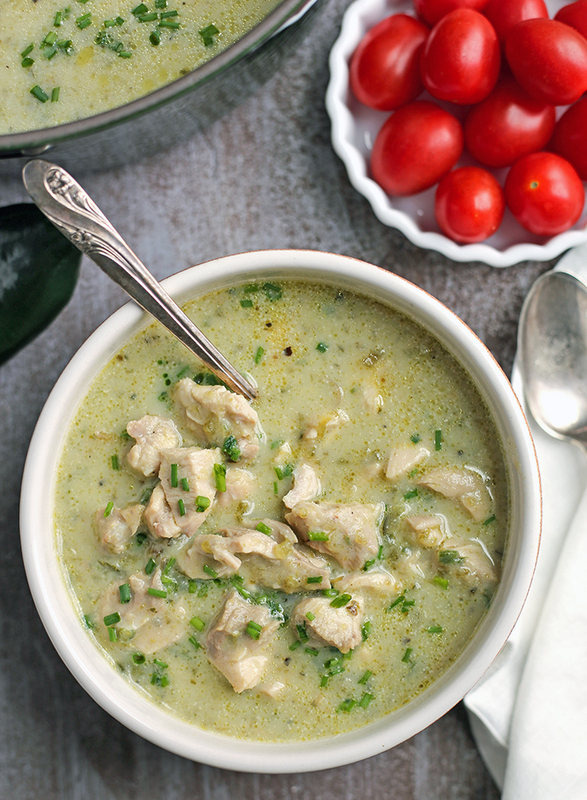 An immersion blender makes this recipe so easy. HERE is the one I have and love. I like using it over a traditional blender since it’s easy to clean. It’s used for both the soup and potato mixture here. 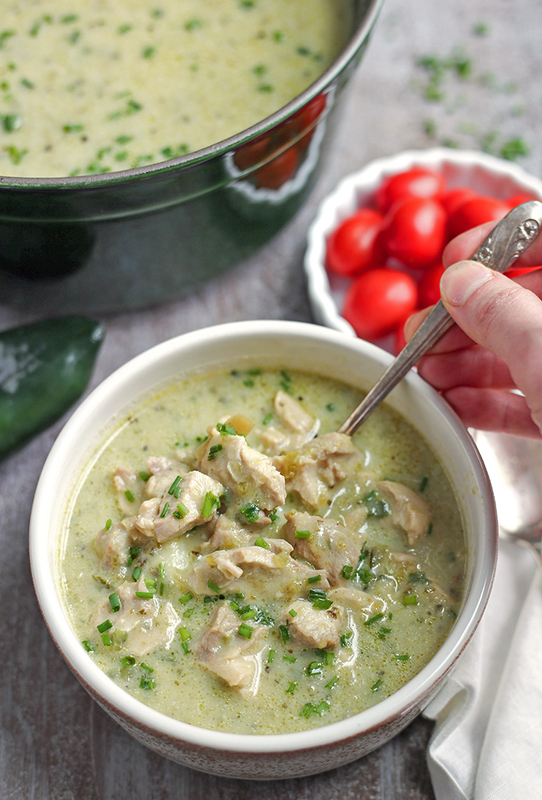 I think you will love this creamy, flavorful soup! 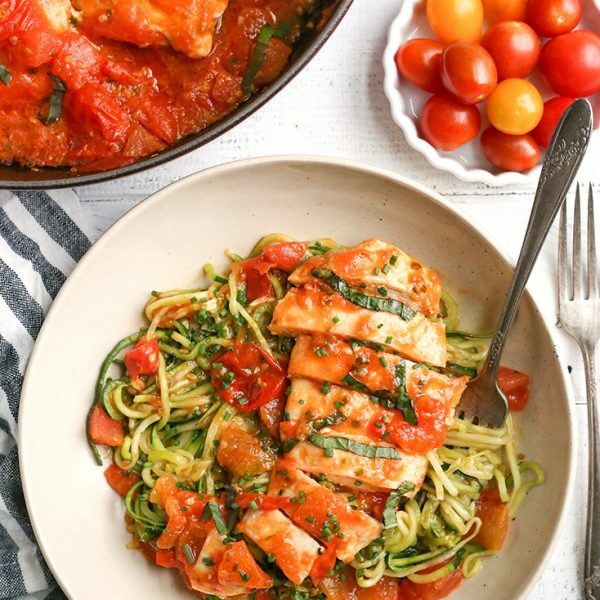 Here are some more soup recipes you may love: Paleo Whole30 Creamy Chicken Tomato Soup, Paleo Whole30 Chicken Pot Pie Soup, and Paleo Whole30 Pesto Chicken Zoodle Soup. Roast the peppers. 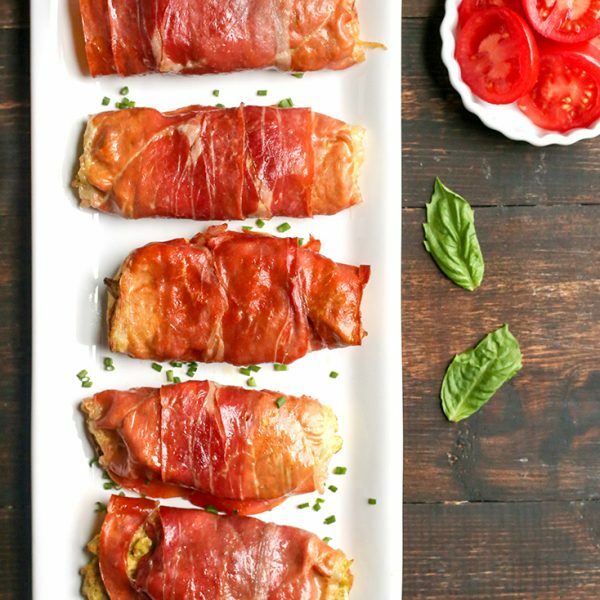 You can do this on a sheet tray under the broiler or in an air fryer. This should take around 10 minutes, depending on the method you're using. Turn peppers as needed so all sides are charred. As soon as they're done, place them in a large bowl and cover with plastic wrap. Let sit 10-15 minutes to let them steam. Peel the skins off, cut open and remove the seeds and stem. While you are cooking the peppers and letting them cool, make the potato mixture. In a small saucepan, add the potatoes, salt and enough water to just cover them. Heat over medium and bring to a boil, reduce heat to medium/low, cover and cook 10 minutes or until fork tender. Drain and add the almond milk. Start with 1 1/2 cups and add more if needed. Use an immersion blender and blend until smooth and creamy. Set aside until needed. Add the cooked Poblano peppers, green onion, garlic oil, and salt to a large stock pot. Cook for 3 minutes on medium heat. Add in the broth (or water) and turn the heat off. Using an immersion blender, blend until smooth. Add the raw chicken and cover and cook until chicken is cooked through- about 13 minutes. Remove the chicken to a cutting board. Add the potato mixture to the soup mixture and stir. 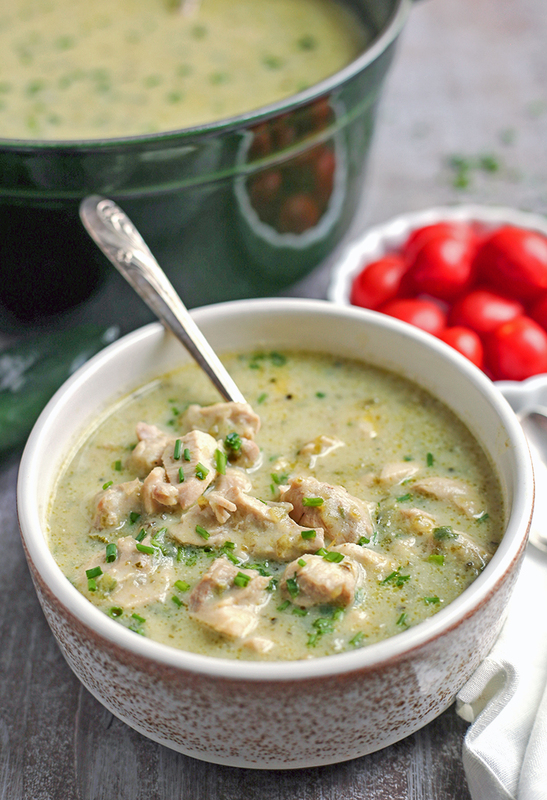 Chop up the chicken and add back to the soup. Stir and serve warm. This looks so delicious, but what if one can’t do regular potatoes? Would white sweet potatoes work? Thanks, Judy! I would recommend using cauliflower. Hope you try it! How many people does one recipe serve? Hi Kristin- I’d say about 4-6. I hope you try it! 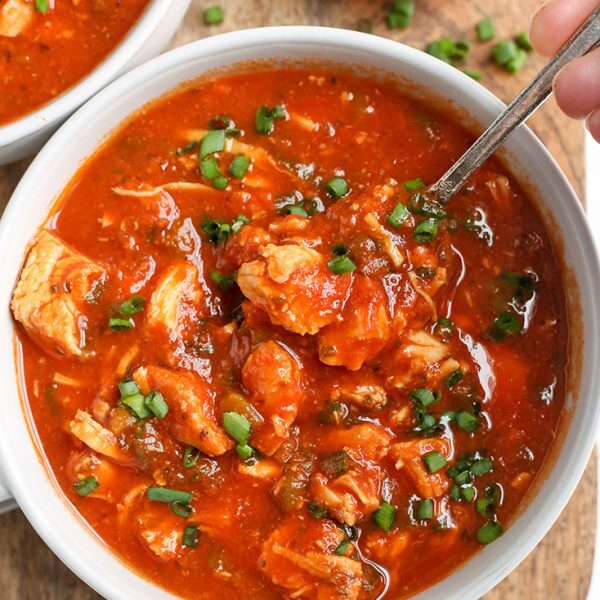 Do you have an instant pot recipe for this chili? Hi Sally- I don’t, but here is my suggestion. You can do the soup part by adding all the ingredients and cooking for 7 minutes. removing the chicken and chopping it and adding in the potato mixture. Make the potato mixture on the stove while the soup is cooking. Hope that helps.